The Giants face some rotation issues for the 2012 World Series as a result of using Ryan Vogelsong and Matt Cain in the final two games of the NLCS. 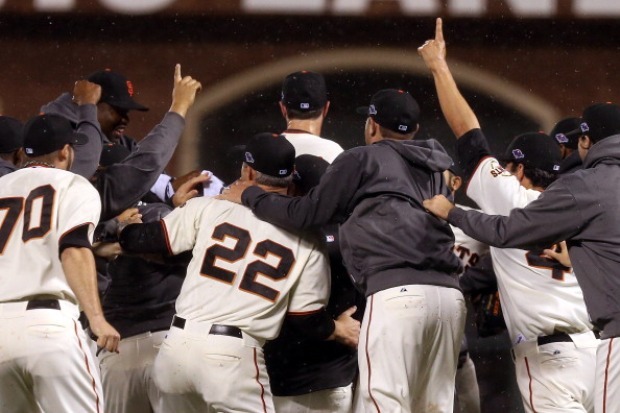 The good news is obvious: the Giants won the 2012 National League pennant. And they did so in improbable fashion, winning three-straight elimination games to defeat the previously unbeatable Cardinals. That's why the bad news is a little more subtle: the Giants don't have the perfect rotation setup for the World Series. Because the NLCS went seven games, Bruce Bochy's likely going to need to get a little kooky with his lineup in order to maximize the Giants chances of winning. Because of the way the World Series schedule is set up, he has almost to roll with Barry Zito in Game 1. Ryan Vogelsong pitched Game 6 of the NLCS and Matt Cain pitched Game 7, so they're off the table for Wednesday night. Where it gets interesting is Game 2 of the World Series. Bochy must make a call to either go with Vogelsong Thursday (who pitched Sunday, so on three days rest) or trot out one of Madison Bumgarner or Tim Lincecum. Whether or not he's forced to use one of them in long relief for Game 1 could obviously help determine what Bochy does. Neither Bumgarner nor Lincecum's been effective starting this postseason, but CSNBayArea.com's Andrew Baggarly reported recently that Bumgarner "found something" in a recent side session. If he can come back and be effective, the Giants chances of winning this series improve exponentially. Game 3 seems like a lock for Cain to start: he'll be on four days rest at that point and it opens him up for a second start in the World Series. Bochy would rather pitch Cain at AT&T Park, but those are the breaks when you need seven games to win the NLCS. Game 5 is a reset, with Zito likely coming back out to face Verlander, if necessary. Whoever pitched Game 2 is a good bet to go in Game 6, if necessary. If it's Vogelsong, he's on five days rest and there's no question he'll go if healthy. If it's Bumgarner or Lincecum, they might need to pitch particularly well to have Bochy trot them back out unless the Giants have a series lead, because Matt Cain would be available on three days rest. But Game 7 is the likely spot for Cain, having pitched Game 3 -- he'd get four days rest and be able to pitch in a potential series-ending Game 7, should it go that far. As you can see, it's basically a total nightmare for the Giants. The good news is that the guy making the calls -- Bochy -- has proven to know exactly what he's doing this postseason.